appointed by the Brisbane City Council. To investigate what further facilities for crossing the Brisbane River are necessary and also as to the best sites for same. (Sometimes referred to as the Hawken Plan). To investigate what further facilities for crossing the Brisbane River either by Bridges, Tubes, or other means, are necessary, and also as to the best sites for erecting and constructing such Bridges, Tubes or other means as are now necessary, or which may be necessary for the future development of the Greater City of Brisbane. We look here at the recommendations, and call on the Brisbane City Council and the Queensland Government to finally build the river crossings which have been neglected in the 92 years since they were identified as both necessary, and the most desirable crossing locations. Although not on the exact alignment originally proposed, the function of this bridge and canal were essentially achieved when the Story Bridge was built in 1935. Its higher level left clearance for shipping traffic so that the canal was not required. A Low level bridge on piers from Quay St to Grey St. This Grey St Bridge (later renamed the William Jolly Bridge) was in fact the first new bridge built, in 1932. The Commission called for an upgrade to Victoria Bridge as a priority. In reality, this took until 1969. Connect Sydney St New Farm to Wellington Rd, East Brisbane via a “transporter bridge”, and later a low level bridge with an opening span next to the shore. This connection is still outstanding, although the CityCat terminals at nearby Mowbray Park and Sydney St might be argued to service the connection at intervals, and provided you don’t want to travel at night. The plan called for a bridge over Oxley Creek near the Brisbane River. Or as an alternative, suggested acquiring the railway bridge at Indooroopilly and adapting that for a road bridge, then building a stronger railway bridge alongside. Both these options were eventually completed, with the Walter Taylor Bridge at Indooroopilly (next to the rail bridge) opened in 1936, and the Pamphlet Bridge across Oxley Creek in 1964. A bridge across the Bulimba Reach remains outstanding 92 years after this recommendation was made. Many would argue that the situation has changed very little since in the intervening decades! Developments at St Lucia and Toowong were apparent, and the Commission recommended a low level bridge at a site across the narrow part of the river joining Glenny St and Montague Rd. They noted that on an actuarial basis, a bridge would be cheaper than a ferry, while its capacity and general convenience would be much greater. A bridge here remains outstanding! A vehicular ferry from Racecourse Rd to Apollo Rd, and later a Tube from Beatrice Tce to Oxford St and Lytton Road. A cross-river ferry operated between Apollo Rd and Bretts Wharf for 75 years, before being closed in 1998. These days there is a limited service via CityCat. The development of the previous Bulimba Barracks site would be the ideal time to reconsider a crossing at this point of the river, but it’s unclear how this could fit with the Kingsford Smith Drive infrastructure. The report recommended a transporter bridge from Edward St to Kangaroo Point for local traffic, as well as a Tramway Tube from George St to the Main St – Vulture St corner. In 2018, plans for a railway tunnel under the river at approximately this location are well advanced, with the Queensland Government’s Cross River Rail project, while yet another investigation into a pedestrian and cycling bridge has been commissioned. A ferry, and later a low-level bridge from Carmody St to Dutton Park. This has effectively been achieved for the pedestrians, cyclists, and public trasnport users via the Eleanor Schonnel Bridge, built 80 years later in 2006. Perhaps most surprisingly, the report called for a High Level Bridge from New Farm to Galloway’s Hill, connecting James St and Merthyr Road on the northern side to Agnew St and Cleveland Rd (now Wynnum Rd) on the southern side. This was envisaged to connect to a railway development to Balmoral which at that time had been foreshadowed by the Commissioner for Railways, and to the existing Cleveland lines – presumably near Morningside. 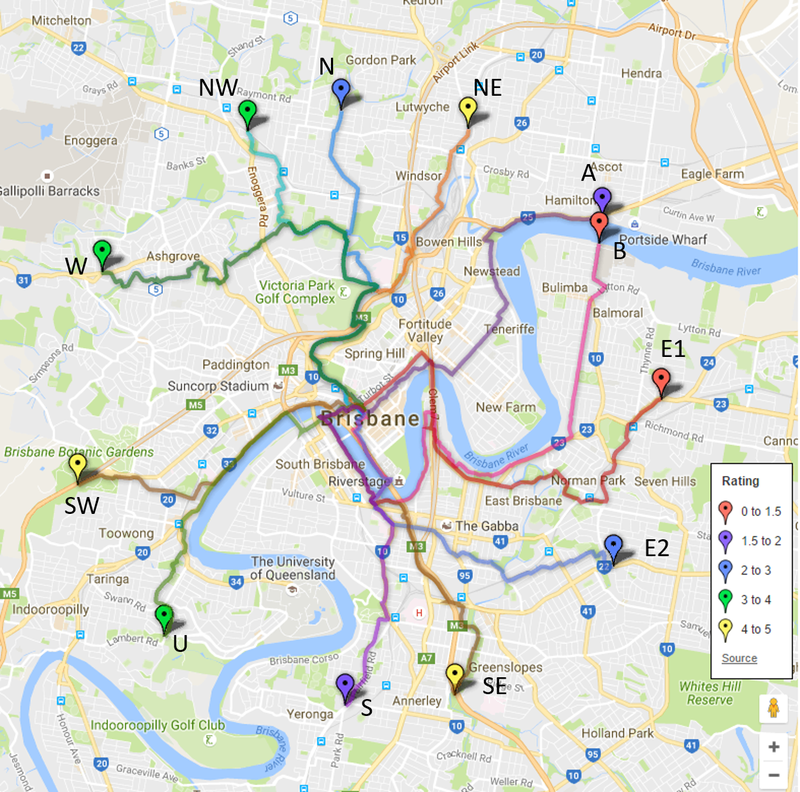 This is makes a total of four bridges recommended downstream of the Story Bridge servicing what are now inner suburbs, which were never constructed. Next Poor public transport or poor planning?